The future isn’t looking good for Nissan’s most affordable hatchback right now. We’re talking about the Versa Note hatchback, which will be ending production in April according to a 2019 order guide obtained by CarsDirect. Nothing official has been announced by Nissan yet, but this is usually a sign that a model is about to be discontinued. In a market saturated with large SUVs and crossovers, the demise of another small economical hatchback doesn’t come as a huge surprise. Sadly, this means US customers looking to buy a new small family car could have even less choice soon, as models such as the Fiesta and Chevrolet Cruze are also being discontinued. Nissan sold 75,809 Versas last year, but this number includes both the Versa Note hatch and the Versa Sedan. If you need a comparison, the Nissan sold 42,000 units of the more expensive Rogue and Rogue Sport in December 2018 alone. The Versa Sedan, on the other hand, appears to be safe for now as order guides suggest the automaker will still offer the four-door Versa until at least 2020. Whether it remains on sale beyond 2020 remains to be seen, as Nissan is planning to add more cost-adding features to its lineup like automatic emergency braking. 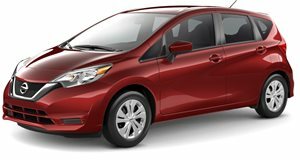 With a starting price of $15,650, the Versa Note is Nissan’s second most affordable model after the Versa Sedan, which starts at $12,360. It was first introduced in 2014 to compete with subcompact models like the Honda Fit and received a facelift in 2017 adding some cosmetic changes and more customization options. Power is provided by a 1.6-liter DOHC 16-valve four-cylinder that sends 109 hp and 107 lb-ft of torque through an Xtronic CVT transmission.